Privacy protection means having a trusted and reliable resource for the destruction of your confidential information. All document destruction takes place on-site at your business while you watch. Whether you choose our one-time purge shredding service or our scheduled document shredding solution, you can always expect timely service, fair pricing and the utmost in professionalism. Call us at 214-333-3453 today or complete the form on this page to learn more or receive a free quote! 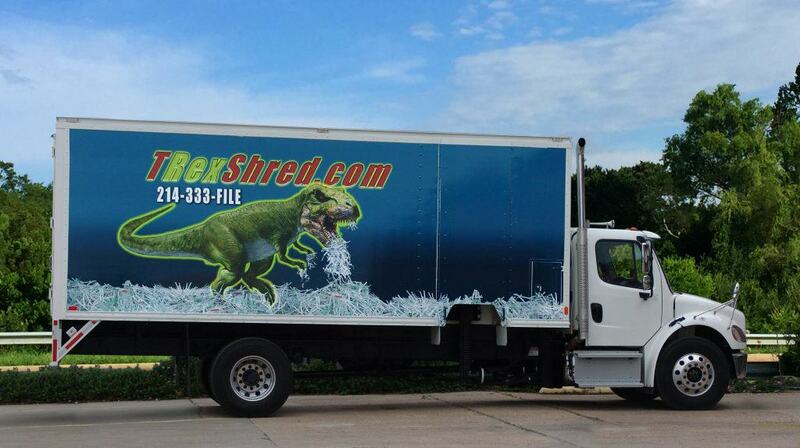 We never outsource our paper shredding to third parties. From start to finish, screened and uniformed TRexShred shredding technicians collect, handle and destroy your documents with an unbroken chain of custody. After your documents are destroyed with our mobile shredding truck, we provide you with a Certificate of Destruction to prove they were securely destroyed. Sometimes you need your sensitive documents destroyed on an as-needed basis. Our one-time purge service offers a quick, easy and affordable solution for destroying the expired files cluttering your office. Whether you have an entire file room filled with old stacks of paperwork or just a few boxes of documents, we destroy your information on-site at your business and give you a Certificate of Destruction for documented proof of HIPAA, FACTA, SOX and GLBA compliance. For more information about our shredding services in Arlington, please contact us at 214-333-3453 or complete the form on this page.